I have a terrible feeling that I might have walked past this marvellous piece by Stik several times over the last year or two. It doesn’t look especially new, but I have just never noticed it before… there is always reward in looking up. I have said it before about his pieces, but it is incredible how much emotion he manages to convey with these simplest of characters that have no features other than dots for eyes. It is also interesting how your mind completes the picture where the windows break up the artwork. Rivington Street is a great place to see street art, and if you should happen to go, don’t forget to look up. 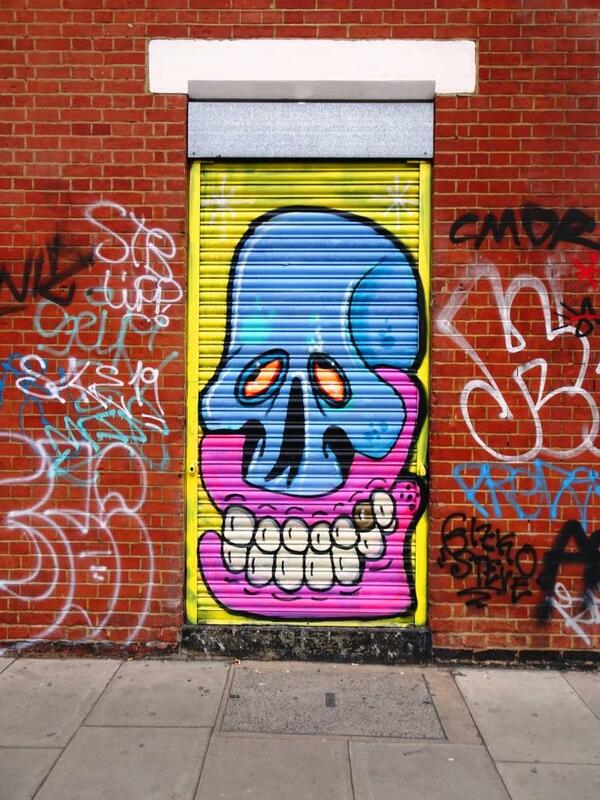 Back to some more incredible work from Shoreditch. I am still only a fraction of the way through posting some great pieces from my November trip to the ‘Big Smoke’ – I love the Bristol scene, but it is great to get out and see what else is out there. This is a beautiful character and writing combo from the highly respected and accomplished artist Tizer. Although I have heard of him and seen a few of his pieces, I know little about him, until I read this spectacular interview on the Bombing Science website. If you do nothing else today, you really ought to dig this out and give it a quick read, he is an amazing guy. This vibrant piece is so full of class and is clearly the work of a highly experienced writer. The lettering is quite organic but beautifully proportioned and the character looks like a throwback to the ’70s or ’80s. A tidy piece. Now go and read that interview. A few weeks ago Fiva painted a fabulous piece in St Werburghs tunnel, and you know what? he’s only gone and done it again pretty much directly opposite the first. The piece is similar in that it uses the clever layering of two different scripts, saying FIVA/Fiver, superimposed on one another. The lettering has a rather crafty 3D thing going on too. It is always a great pleasure seeing work by this occasional (compared to some of the others) street artist, especially as his work is so clean and tidy. I’m not too sure who the character on the left is, but the grayscale tones contrast really well with the blue and purple writing. Another great work from Fiva. When I saw this back in 2016 I was still at the early stages of learning about the street art scene in Bristol (in fact I am still learning every day) and I knew little about the RAW crew and the artists constituting it. While it is obvious that the character on the right is by Jaksta (the medallion gives this away) the writing is less obvious. It looks like the letters say WARE to me, but here I am showing my ignorance because I don’t know the artist at all. The writing is beautifully executed and I love the musical notes sitting on the midway line on the blue letters. A really nice piece of street art for the festival.